-I see a nose on every face. 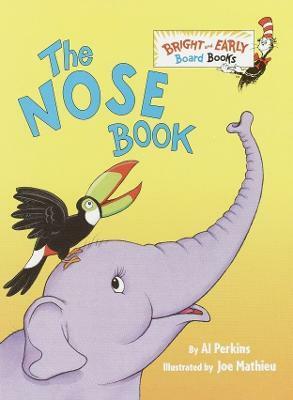 I see noses every place!- Noses come in all shapes, colors, and sizes and are handy to have for sniffling, smelling, and . . . playing horns? This simple, sometimes silly story offers little ones a first ode to the nose and all that it does. "I see a nose on every face. I see noses every place!" Noses come in all shapes, colors, and sizes and are handy to have for sniffling, smelling, and . . . playing horns? This simple, sometimes silly story offers little ones a first ode to the nose and all that it does. Al Perkins was the author of several Bright and Early Books and Beginner Books, among them Hand, Hand, Fingers, Thumb; and The Ear Book. Perkins passed away in 1975. Joe Mathieu has illustrated countless books for children, including Big Frank's Fire Truck, Sesame Street titles, books in the Cat in the Hat's Learning Library series, and many more.